Harri Koskinen (b. 1970) is one of Finland’s most acclaimed designers. 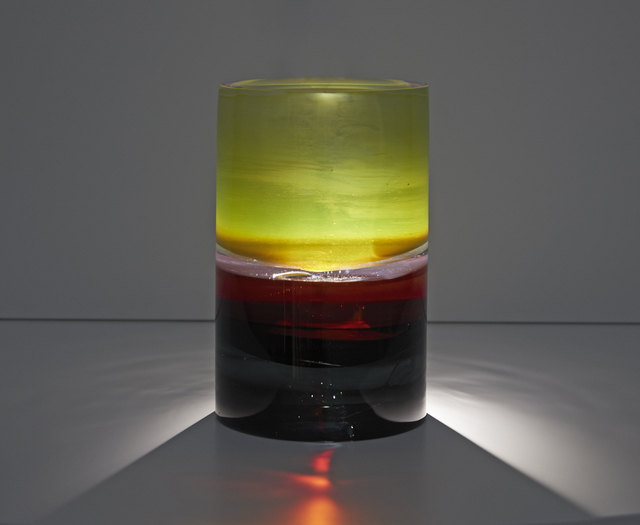 His new exhibition at Galerie Forsblom presents a pick of unique glass sculptures hand-made with Pino Signoretto in his legendary studio in Murano, Venice. Fusing light and energy in a compact, reductive form, his sculptures are an intriguing study of space, mass and volume. Glass – melted sand in petrified form – is itself a magical manifestation of the laws of physics. While solid and heavy, Koskinen’s sculptures have an airy, liquid appearance. The many layers of glass evoke topographies: they are like sediments or layers of the atmosphere. The visors of the helmet-like glass sculptures in the Transition series take us on a spatio-temporal journey from rural landscapes to sci-fi-inspired cityscapes. Staring straight ahead, as if on guard duty, these combined glass and mixed-media pieces were crafted at the Iittala glassworks. Effortlessly shifting between one-offs and serial production, Koskinen works across a wide spectrum of materials. During his extensive career, he has worked as the Design Director of the Iittala brand and as a designer for Artek, Svensk Tenn, Muji and Issey Miyake. Koskinen has been awarded several major design prizes, such as the Torsten and Wanja Söderberg Prize (2009), the Compasso d’Oro prize (2004) and the Pro Finlandia Medal (2007). Koskinen lives and works in Helsinki.